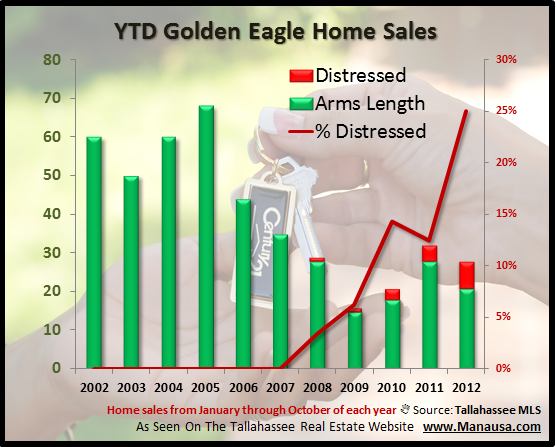 We often are asked about trends in the different Tallahassee neighborhoods for which we report at the Tallahassee Real Estate Website, and none is requested more often than Golden Eagle Plantation. I am always amazed when somebody is willing to buy or sell a home in an exclusive neighborhood without having a full understanding of the underlying trends that are guiding values there. For example, there currently are 41 homes for sale in Golden Eagle Plantation that are listed in the Tallahassee MLS, and there are quite a few more that will be joining their ranks after the holiday season. While this might not seem like many when you consider the thousands that are for sale in Tallahassee, but the relative home supply above $400K tells another tale. 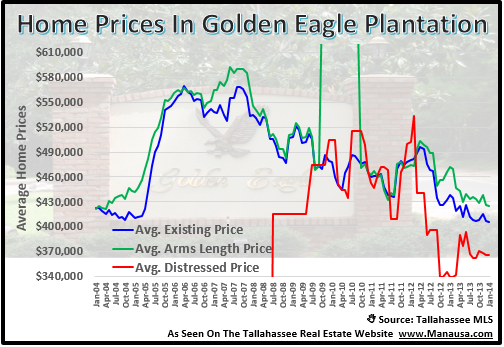 The average sales price for homes in Golden Eagle Plantation has dropped below $450,000, and with the threat of rising interest rates, we can expect this price point to continue lower for the foreseeable future. 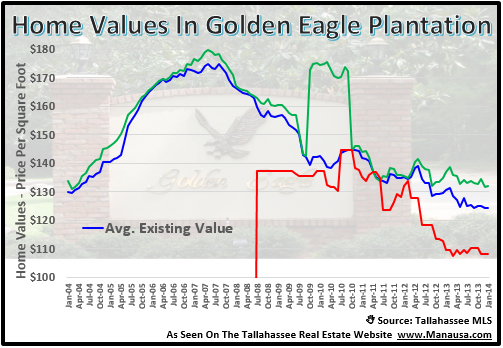 Similarly, home values in Golden Eagle Plantation have dropped 3.3% since last year, as the supply of homes far exceeds current demand. With roughly 15 months of supply available, homebuyers are enjoying the offerings in this Tom Fazio golf course community. Home sellers must begin to really watch the competition, as more and more homes are joining the distressed property list. Short sales and foreclosures are on a rapid rise, as many homeowners have given up waiting for a real estate market recovery and have let the homes go back to the bank. Of course, there are some great deals in wonderful condition that are not distressed (like this Southern Living home on the lake), so the prudent buyer must be value focused. If you are interested in buying a home in Golden Eagle Plantation or selling a home in Golden Eagle Plantation, just drop me a note and we can update you on the most relevant trends that will affect you and your housing needs. I hope you gained a better understanding of current trends in Golden Eagle Plantation, please check us out again in the future for more updates of many Tallahassee neighborhoods.